That comes to roughly $30 billion more than today’s $63-$65 billion in annual revenue, according to 2012-2013 Pew Research estimates in the new State of the News Media report. From 2006 through 2012, about 17,000 full-time newspaper newsroom jobs were lost, according to the American Society of News Editors census. In 2006, print and digital advertising accounted for fully 82% of all known revenue tied to professional newsgathering, which was before the Great Recession further damaged the economics of the news business. 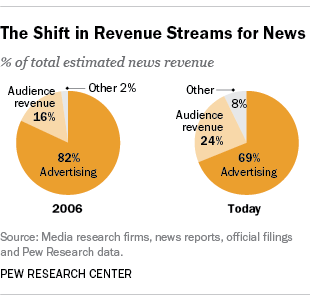 Today, advertising still accounts for a majority of news revenue, but amounts to 69% of the revenue pie, more than half of which comes from the newspaper industry whose ad revenue declined 55% from 2006 to 2012. As advertising has shrunk, revenues generated from news consumers, which include subscriptions, cable fees and individual charitable giving, have become a larger slice of the pie. In 2006, we estimate that they accounted for just 16% of all revenue tied to newsgathering. Today, these audience-driven streams account for 24% of all revenue—about 50% more than in 2006. There is, however, a twist to those numbers: Even as it has grown as a share of the total pie, in actual dollars, news-related audience revenue is about the same as what it was in 2006. Adjusting for inflation, the 2006 figure is estimated at around $15 billion, just as it is today. But that doesn’t mean it’s been stable all those years. Newspaper circulation revenue, after five years of decline from 2006-2011, grew 5% in 2012, tied to both print price increases and digital subscription plans. It is expected to stay even or see slightly smaller gains in 2013. In the television news business, retransmission fees, which ultimately benefit cable and broadcast networks and their newsrooms, have been steadily on the rise over the past handful of years as has the typical monthly cable bill. 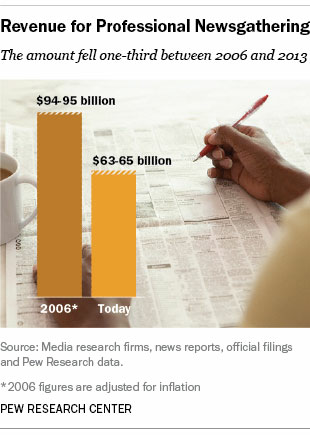 Pew Research estimates the retransmission money funneled to TV newsrooms has doubled since 2006. Public radio data indicate that while individual giving to stations was down in 2012 by 3%, the roughly $400 million estimated for that year was the second-highest in the last 16 years for which data are available. And the recent proliferation of digital news outlets—both for- and non-profit—has at least modestly nurtured audience revenue streams through memberships and subscriptions. There’s yet another small, but growing group of revenue streams in the journalism business: Foundation grants, events and digital marketing services, and direct investments from venture capital groups and owners have grown from roughly 2% of all news-related revenue in 2006 to about 8% today. One example of this influx of capital was eBay founder Pierre Omidyar’s initial $50 million toward the launch of the digital news operation First Look Media, the first part of an announced $250 million investment in the project. Few industry analysts expect the advertising revenue that’s been lost in recent years to come flooding back to news organizations. While audience revenue is becoming more critical to the business, it cannot fully compensate for the loss of ad dollars. That is why most conversations about news sustainability come back to “all of the above”—cultivating a variety of revenue streams, including non-traditional ones, and experimenting with new ways of paying for journalism.